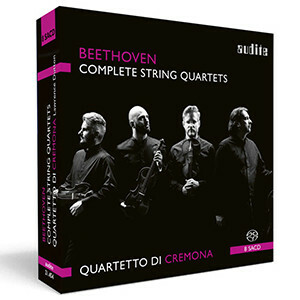 Quartetto di Cremona Releases Beethoven Box Set | Kirshbaum Associates Inc.
Today, the Quartetto di Cremona releases an 8-disc box set of the Complete Beethoven String Quartets. Originally released as eight individual volumes from 2013-2017, this edition includes all of the composer's string quartets, alongside his String Quintet Op. 29, featuring Emerson String Quartet violist Lawrence Dutton. Recorded for the Audite label, this box set is now available in stores and online everywhere.